El Consorcio HETS y Virtual Educa unen esfuerzos para colaborar en proyectos con entidades de países de América Latina y el Caribe. El Consorcio HETS y Virtual Educa firmaron hoy un Acuerdo de Colaboración que permitirá aunar esfuerzos para concretar proyectos ­que relacionen entidades de países de América Latina y el Caribe entre sí y con organismos afines de otras regiones del mundo. 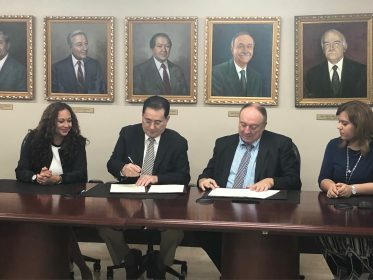 La firma del Acuerdo se realizó en la Oficina Central de la Universidad Interamericana de Puerto Rico (UIPR) y contó con la participación del licenciado Manuel J. Fernós, Presidente de UIPR y Tesorero de HETS, el Dr. José María Antón, Secretario General de Virtual Educa, la Sra. Yubelkys Montalvo, Directora Ejecutiva de HETS y la Dra. Suleira Quiñones, Principal Oficial Ejecutivo de la Fundación Virtual Educa. Casa llena durante la celebración del 5to Aniversario del HETS Student Leadership Showcase. 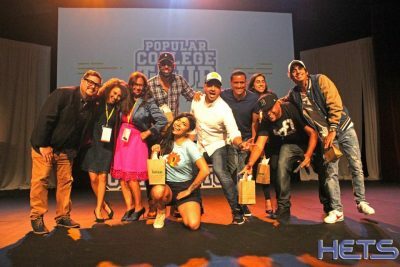 Más de 700 estudiantes participaron del 5to Aniversario del HETS Student Leadership Showcase el pasado viernes, 14 de septiembre de 2018 en el Teatro del Recinto Metropolitano de la Universidad Interamericana en Cupey. En esta edición, tuvimos casa llena con estudiantes de las instituciones afiliadas en Puerto Rico: American University, Atenas College, Universidad Carlos Albizu, Colegio Universitario de San Juan, EDP University, National University College, ICPR Junior College, Universidad Central del Caribe, Universidad de Puerto Rico, Universidad Politécnica, los anfitriones la Universidad Interamericana de PR además de instituciones invitadas como la Universidad Central de Bayamón, Atlantic University y la Pontificia Universidad Católica de PR. 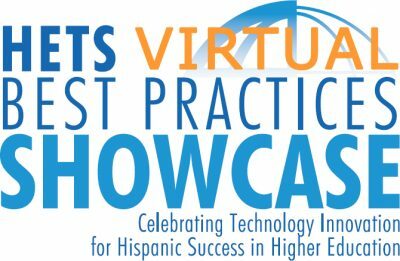 HETS 2019 Virtual Best Practices Showcase’s new deadline to submit Proposals is December 3rd, 2018. HETS Executive Committee elected during the 2018 summer Board Meeting in New York. HETS Executive Committee elections were held during the annual summer Board Meeting celebrated at Bronx Community College, NY on July 13, 2018. 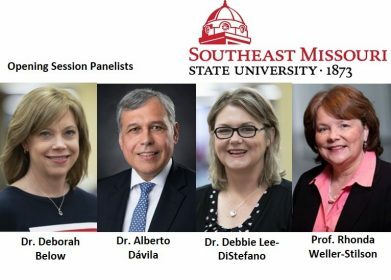 President of Southeast Missouri State University, Dr. Carlos Vargas-Aburto, was reelected as HETS Chair. Collaborating with Dr. Vargas-Aburto, Dr. Carlos Morales, President of TCC Connect at Tarrant County College in Texas, was elected as new Vice Chair. HETS closes year 2017-2018 with Board Meeting in NYC, while starting the celebrations of its 25th Anniversary. The HETS summer Board of Directors meeting, and its 25th Anniversary celebration, were held July 12 and 13, 2018 in Bronx, NY, hosted by Bronx Community College of the City University of New York (CUNY). This Board meeting ends academic year 2017-2018, an intense year for the organization and its members, as it embarked on the implementation of recently Strategic Plan approved and presenting first year results on this meeting. Dr. Antonio Pérez: A Recognition to a One of a Kind Board Member. HETS celebrated it’s summer Board of Directors meeting closing academic year 2017-18, and starting the celebration of its 25th anniversary on July 12 and 13, 2018 in Bronx, NY. This was an excellent opportunity to surprise Dr. Antonio Pérez, President of Borough of Manhattan Community College, on his last participation on this meeting as one of our Board Members since 1999. He also was invited to give the main speech during the first event of the HETS anniversary celebration. Hostos Community College hosted the Student Leadership Showcase in New York. 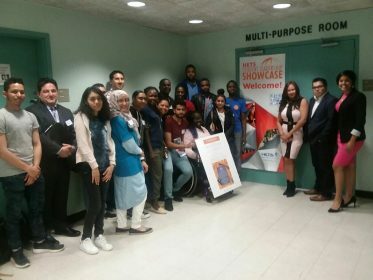 Hostos Community College hosted the Student Leadership Showcase held on April 23, 2018 at it’s Savoy Multi-purpose Room in Bronx, New York. More than 40 students from Hostos and Lehman College member institutions, participated of this event. The main purpose was to promote the access to free of charge online student services that can support their academic goals, and be able to share their interests and needs to help us create additional support services. This time students also learned about how to maximize the use of digital identity and social media to support their academic and professional goals. First North American School of Internet Governance opened the discussion for the ICANN 61 Conference in San Juan Puerto Rico. As part of the HETS collaboration with the Internet Society PR Chapter, the first North American School of Internet Governance (NASIG) took place at the Polytechnic University of Puerto Rico in San Juan, during March 7 to 9, 2018. Students from countries like United States, Puerto Rico, Armenia, Canadá, Romania, among others, participated in this in-depth capacity building event that seeks to empower the next generation of Internet leaders. This School opened the discussion for the ICANN 61 Conference, held in San Juan Puerto Rico from April 10 to 15, 2018. Videos of the 2018 Best Practices Showcase presentations available in HETS YouTube Channel. The access to the video of the Best Practices Showcased presentations during the 2018 conference held in San Juan, Puerto Rico is available for the benefit of those who didn’t have the opportunity to attend. You may find them on the 2018 Best Practices Showcase webpage, under the Schedule menu. The 2018 Best Practices Showcase and Academic Fair gathered more than 25 Institutions from Puerto Rico and United States. HETS “Celebrated Technology Innovation for Hispanic Success in Higher Education” with its Best Practices Showcase, bringing together more than 25 of its member institutions in Puerto Rico and United States. This event took place Thursday, February 1st and Friday, February 2nd, 2018 at Inter American University of Puerto Rico, Metro Campus in San Juan, Puerto Rico; and allowed the Consortium to share innovative projects and best practices. This was the fifth time that HETS was able to host this event for the benefit of attendees from different Higher Education institutions. Board Members celebrated its Winter Meeting along with the 2018 Best Practices Showcase in San Juan, PR. The HETS Board of Directors winter session was successfully celebrated in San Juan, PR concurrent with the 2018 Best Practices Showcase. 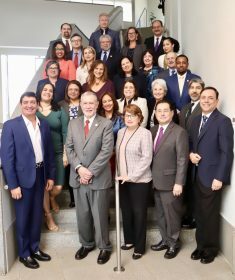 Representatives of more than 25 member institutions from Puerto Rico, New York, Texas, Missouri, Connecticut, Massachusetts, and California were present at the meeting and agreed on the priority activities for the next semester. These events were held and hosted by the Metropolitan Campus of the Inter American University of Puerto Rico, in San Juan. The first session of the Board meeting took place on Thursday February 1st, 2018. During the first session, HETS Executive Director, Ms. Yubelkys Montalvo presented the organization’s status report and efforts to continue with planned activities and services despite the difficult circumstances and Hurricane María aftermath. Among the exiting news shared with the Board of Directors, one was the fact that seven new members join HETS.